Professional and friendly. Best dentist around! Also on time and great with children. Loved our experience. Staff and office were both great. A very nervous 6-year-old left thinking the dentist is the best place ever! My kids actually like going to the dentist! The staff is wonderful and kind. Dental work is completed quickly and well. I would recommend to anyone looking for a pediatric dentist! We love seeing your kids smile!!!! At Drs. Delaney, Root & Associates, PC, our Waterford pediatric dentists are dedicated to providing comprehensive dental care for infants, children and teens in a gentle, fun and family-friendly environment. We love kids, and we believe that with good home care and regular dental visits your child can grow up cavity free. Whether it's your child's first visit to our Waterford office, or just a routine checkup, we strive to make sure you and your child are always comfortable and informed. We take the time to talk with parents to help equip you and your child with the knowledge necessary for good oral hygiene. Please use this website to learn more about pediatric dentistry, our friendly staff, treatment options, office details and even to request an appointment. Our talented pediatric dentists in Waterford and friendly staff know how to make your child smile in a fun, encouraging office setting. We specialize in dentistry for kids, and we've even undergone special training in order to cater to the needs of little mouths and reduce any uncertainties they may be feeling about the dentist. From routine cleanings and emergency treatment to preventive care and oral hygiene instructions, Drs. Delaney, Root & Associates, PC provides a full range of services related to pediatric dental health. When kids grow up having positive experiences with the dentist, they are more likely to continue down a path of good oral health and regular dental visits into adulthood. Our highly qualified Waterford pediatric dentists look forward to helping your child create an early foundation for strong dental health. 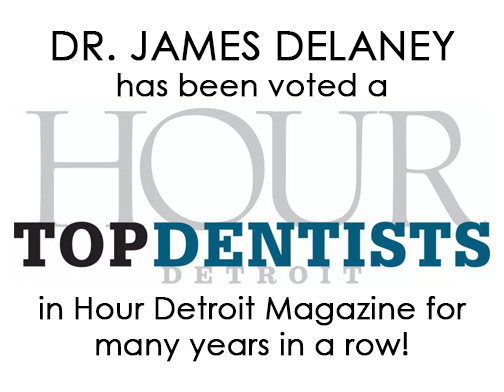 Dr. Delaney received a dental degree from the University of Detroit Mercy and furthered his pediatric education and experience through a residency program at Children’s Hospital in Detroit. He also received additional training in growth and development and child psychology to ensure the highest quality of child dental care. His advanced specialized training is beyond the requirements for a general dentist. Dr. Randall Root earned his dental degree from the University of Michigan and his Master of Science Degree in Orthodontics from there as well. Your child won't keep his or her first teeth forever, but that doesn't mean those tiny pearly whites don't need conscientious care. New parents have plenty to worry about: making sure their baby is healthy and happy, re-arranging their lives around hectic schedules and lost sleep, and figuring out what to do in all sorts of novel situations.